Welcome to the March edition of Meezer Musings! This should have been sent out at the end of February but a few little hitches, mainly problems with technology, meant that I couldn't send it out earlier. So here we are at the beginning of March instead. Following on from January's piece about vets, veterinary treatment and how to pay for it all, this time we're taking a look at when a cat might need to see a vet (apart from any regular check-ups and necessary vaccinations, obviously). Cats are masters at disguising pain, so how can you tell when something might need investigating, or treatment? The list of signs of pain will help you check your cat's behavior to determine any potential problems, and we also look at 'red flag' situations - times when you must take your cat to the vet as a matter of urgency. 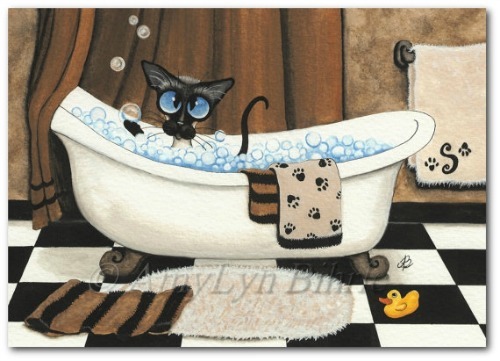 After that, we have a featured artist, AmyLyn Bihrle, who paints the most adorable Siamese cats - you can see some of her lovely designs below - followed by our usual Meezer of the Month and Fun from Facebook features. I belong to a series of online cat groups and one of the most frequent questions is from people asking for advice or wondering whether or not their cat should be seen by a vet. A veterinary study published last year in a scientific journal called PLOS One asked a panel of expert cat vets to try and come up with a consensus on how a cat shows pain. Their findings identified twenty-five common signs. Reaction to being touched (applying light pressure). Quite a comprehensive list - and while most of these might indicate low levels of pain, the final five (marked with an asterisk*) were thought to indicate higher pain levels. In particular, look out for changes in feeding behavior, closed eyes, the avoidance of bright areas, growling and groaning. I think we, as pet people and cat lovers, tend to know our cats' behavior well and will quickly spot any problems or changes, but it's better to be safe than sorry and if you're at all unsure, get your cat checked out by a vet. In addition to the behavioral changes listed above, the ones below are possible emergency situations and are times when you should take your cat to the vet as quickly as possible. Many of us (including me) have a built-in resistance to visiting the vet, whether it's because of distance, cost, mistrust, or concern about what the vet is going to say, but a vet is there to work for you and help your pet, so please don't delay, and if you have any concerns about your vet's knowledge and experience, get a second opinion. Moving on to happier things! On our Facebook page on Valentine's Day I shared a post from Southern California Siamese Rescue featuring one of artist Amylyn Bihrle's delightful and mischievous Siamese cats. It was a popular post and I thought you might like to know a little more about AmyLyn's work. AmyLyn Bihrle is a Fine Artist and illustrator with a passion for horses; much of her work revolves around them. She lives in New York and also paints highly recognizable Siamese cats. Cute and funny, with their huge ears and big round blue eyes, I'd seen many of the pictures before I ever knew who the artist was. I've always adored them. Here are two of them. 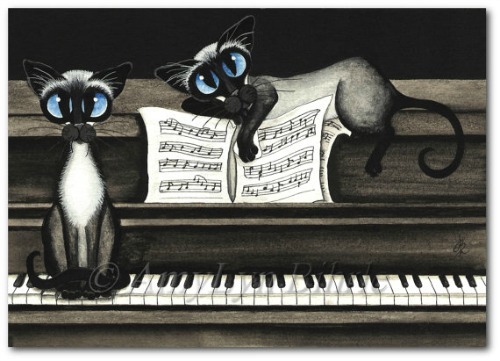 Siamese cats enjoying a lovely bubble bath, and jazzing around on a piano. AmyLyn has a wonderful range of paintings and prints of Siamese cats, black cats, horses, rabbits, wildlife and other critters - there are 73 prints in her Siamese collection alone! You can find and follow her on her Facebook pages, Equine and Fine Art and Cats and Critter Art, and her original paintings and prints can all be ordered through her Etsy shop. Our Meezer of the Month for February is Averi White's Holly (named after Holly Golightly, the heroine of Breakfast at Tiffany's, one of Averi's favorite movies). 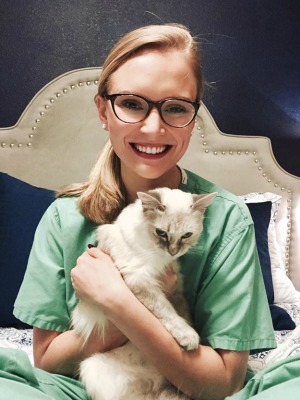 Holly was surrendered at an animal shelter by her previous owner before finding her new home with Averi, a first year medical student in San Antonio, Texas. Averi found her first semester of med. school very stressful and the work was overwhelming, so her mom decided to get her a furry friend to keep her company and help her along. Holly has made the biggest difference to Averi's life; she's much less stressed out now and looks forward to coming home to Holly every day. Holly is around three years old, and tiny - she has short little legs and weighs in at a mighty six pounds! She's very vocal, loves to play ball and watch guests go the bathroom (typical Siamese!) and follows Averi everywhere around the house. Averi contacted me to ask whether I could help her to identify Holly's breed and coloring. This is never particularly easy using photos on a computer, as different screens display colors differently. But see what you think. 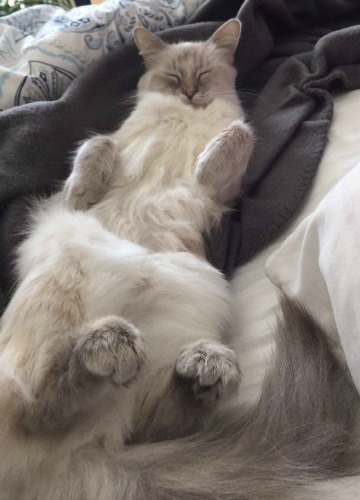 As you can see, with her longish fur Holly looks like a Balinese - a breed that was developed from the naturally occurring long-haired kittens found in some Siamese litters. There are other long-haired breeds that display the pointed coat pattern - Himalayans, Ragdolls and Birmans among them, but their coats are all much thicker than Holly's. Averi was curious about Holly's coloring, because although she thought Holly was probably a lilac point, Holly didn't really look like any of the pictures of lilac points she'd seen. This is because, as you can see in the photo below, Holly's mask is mottled (not solid, as a pure lilac point's would be) and has some peach/orange shading. I think it's likely that Holly is carrying the orange (O) gene, and this would make her a lilac tortie point. (You can read more about tortie points here). 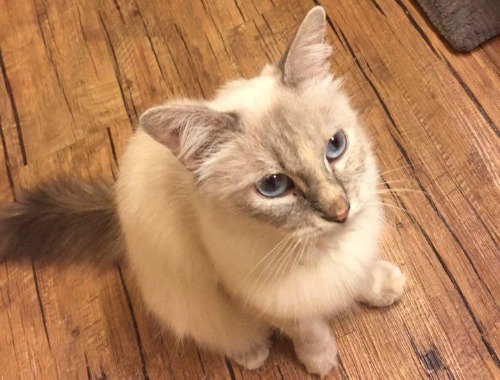 As a rescue cat, Holly's most probably something of a mix and we may never know exactly what her genetic make-up is, but I think she looks most like a lilac tortie point Balinese. Thanks for sharing Holly with us, Averi! I'm always interested in hearing about other people's experiences with litter boxes and different types of litter so I was amused by this photo from our Facebook page this month. 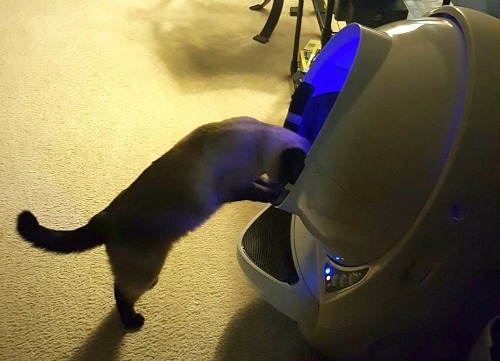 This is one of William Armstrong's cats, Cappo, exploring his new space-age litter box. In case you've never seen one like this before (and I hadn't) it's an automatic, self-cleaning box - the Litter Robot III Open-Air - available on Amazon, where it has some good reviews. One of our other Facebook readers also said that she had one and liked it. Some cats don't like enclosed boxes, so I was looking forward to hearing how the cats were getting on with it, and William says that so far all four of his cats are using it without any trouble. Cappo certainly seems interested in exploring it! 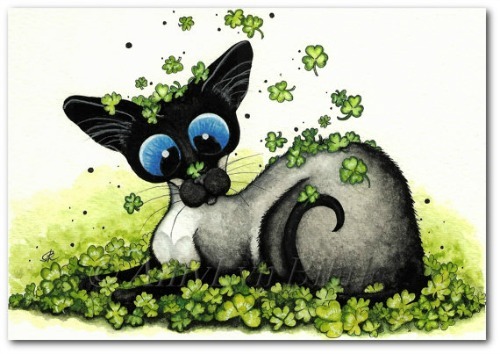 With St. Patrick's Day (March 17th) just around the corner, there's no better way to finish than with a final picture from AmyLyn Bihrle - this time of one of her cats playing in clover. The shamrock associated with St. Patrick's Day is, botanically, a three-leaved clover, as many of the ones in this picture are, although the eagle-eyed among you may spot the odd lucky four-leaf clover here as well! We'll be back again in a month or so. Wishing everyone for whom it's relevant a fun and happy St. Patrick's Day, and to everyone else, a lucky month wherever you are!